Copies of the RPS Portfolio TWO book are now appearing. 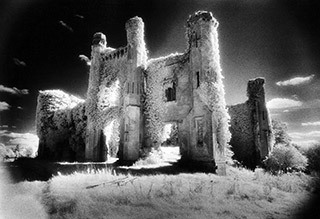 In a magnificent collection of RPS member images and articles are three Infrared 100 items: my history of infrared photography, a similar article on thermal imaging by Francis Ring, and infrared photos from the RPS Digital Imaging Group. More info, and online ordering, on the RPS web site. The paper from the October 1910 Photographic Journal, that started this whole centenary thing off, is now available in facsimile online. It was scanned from a bound set of 1910 Phot J's that used to be in Kodak's archive but is now in the care of de Montford University. This book, as shown above, is currently residing in the cabinet at Fenton House, as part of the Infrared 100 Exhibition, which closes on Thursday. The RPS have linked the paper from this news page or from this direct link (PDF). Archival accessibility preparation by the ATSF palaeontology team ... ie me. An image from the Hubble deep-field telescope has revealed the most distant, and therefore oldest, object ever discovered. It is a galaxy known as UDFy-38135539. A small one, but a galaxy nonetheless and the light from it has taken over 13 billion years to reach us; starting its journey only 600 millions years after the big bang. It is also receding so quickly that its light is red-shifted by a factor of 8.6, such that any visible light is shifted down to the deep infrared. You can see the starfield image on the ESO web site. The story on the BBC web site reveals that this was a 48 hour exposure and the ESO web site tells us that the teams responsible were NASA, ESA, G Illingworth (UCO/Lick Observatory and University of California, Santa Cruz) and the HUDF09 Team. Lick Observatory has historically played a significant part in our infrared imaging story. During the 1920s and 30s scientists at the observatory experimented with infrared photography, as I mentioned in an earlier post. The infrared comparison photos that WH Wright took of Mars in 1924, which proved that Mars has an atmosphere to speak of, were taken there (and are included in the Infrared 100 exhibition at the RPS in Bath this month). If you're interested there is a 2006 paper on the Lick photographs in the Journal of Astronomical History and Heritage (Vol 9, No 2, p 181-184) but it's not available online. And the 48 hours? There's a delicious coincidence which brings me to another historic infrared photograph taken at another famous American observatory, Mount Wilson. 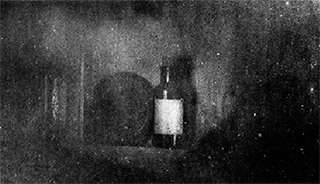 In this case the date is 1930, the photographer is HD Babcock and it is a blurry and unassuming image of some objects on a shelf. It is also the first photograph taken in total darkness. I had a telephone conversation with an archivist at Mount Wilson but, so far, we have been unable to find out whether a real copy of this photo still exists. The one you see here is taken from an old edition of Clark, who says that the 'light' source was one or more under-run electric heaters. The plate was sensitised with neocyanine and the exposure was 48 hours at f/2. So here we have the darker recesses of the universe, one distant and one very close. Both unobservable except using infrared imaging and both taking 48 hours to shoot. Professor Joseph Giacomin works at the Human Centred Design Institute at Brunel University. 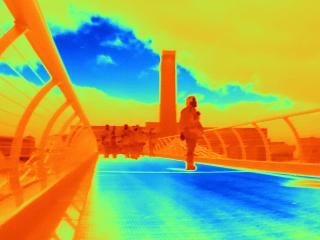 His 'day job' covers things like the design of cars but he has a sideline in fascinating artistic thermal images. Unusually, he is able to get his hands on one of these very expensive cameras and has the artistic eye to use it creatively. 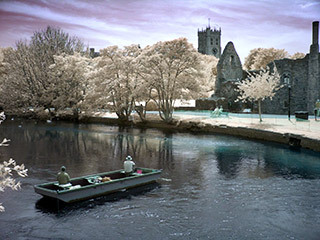 There is one of his images in the Infrared 100 exhibition at the RPS in Bath this month. The thermal people often refer to bolometers. These basically are remote thermometers, and usually work by focussing heat radiation onto something which changes its characteristics, in a measurable way, when it warms up. The original version used a platinum foil strip blackened with soot from a candle. Its electrical resistance changed with temperature. The inventor was Samuel Pierpont Langley, in 1878. This gave rise to the following rhyme/limerick which was quoted several times during the Infrared 100 events last week. Who said science can't be fun! Sadly, it seems Langley actually measured the temperature of a cow from a quarter of a mile ... but that doesn't rhyme [Ref]. There are variations and I believe the original rhyme is by Mr Anon. 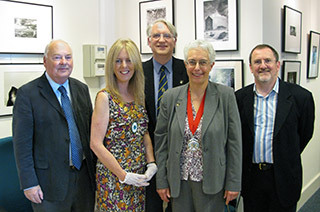 A number of our photographers were able to join us for the launch and Rosemary Wilman, President of the Royal Photographic Society was host. Councillor Sarah Bevan, who is the chair of Bath and North East Somerset Council (known locally as BNES) also gave a short speech, and proved very knowledgeable on the subject too. So, as they say, a splendid time was had by all. The two-day symposium in London was also well-supported and I discovered such things as just how much has been done in infrared astronomy in recent years, not to mention the fascinating way african elephants control their body temperature in an unforgiving climate. My great thanks to Francis Ring and Helen Walker who each organised one of the two days and especially to the hospitality of the Royal Astronomical Society who hosted day one and jointly-branded day two which was in the Geological Society ... both in Burlington House. One guest on both days was Professor Paul Feldman from RW Wood's own establishment, Johns Hopkins University, and it was really great to meet him. I am now starting discussions that I hope will lead to an exciting event next May in central London which will be open to all. Fingers crossed. The Infrared 100 exhibition has opened at the RPS Fenton House Gallery in Bath (a short but uphill walk along Wells Road from the centre of town: MAP). The exhibition runs until Thursday 28th October, 0930 to 1630 Monday to Friday: info on RPS web site. You can also see Karl Ferris's fish-eye colour infrared photo of the Jimi Hendrix Experience, on the cover of their first album as released in the USA. 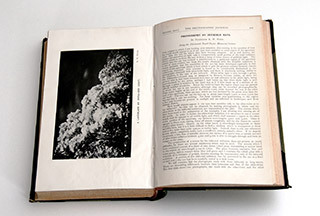 Professor Wood's 1910 Photographic Journal article will also be on display, as is the double-page spread from the Illustrated London News of June 1911. I'll be very interested in your comments if you visit the exhibition. Photos without dates are the contemporary set and all date from this millennium. My huge thanks to Simon Marsden for allowing us to use his photograph to help promote the event. Simon's web sites are: www.simonmarsden.co.uk and www.marsdenarchive.com. I would also like to acknowledge the help of ILFORD Lab Direct, who superbly printed our black and white archival images.